One year ago this month, a Quinnipiac University poll of voters in three swing states highlighted a looming problem for Hillary Clinton's presidential campaign: More than half the respondents in each state regarded her as dishonest. A nationwide CNN poll the same month yielded similar findings: Fifty-seven percent of voters said Clinton was not trustworthy. Democratic sages brushed the matter aside. "Does Hillary Clinton's Trustworthiness Matter?" asked Time magazine in a story at the time. The consensus of the experts it quoted: Nah, not really. "People are looking first and foremost for someone who will . . . get things done for them," said Democratic pollster Geoff Garin. Honesty wasn't essential to victory. After all, went the argument, Bill Clinton won two presidential elections, despite widespread doubt about his trustworthiness. For that matter, so had Richard Nixon. But Clinton's dishonesty problem hasn't gone away. When Gallup asks Americans what word first comes to mind when they hear Clinton's name, by far the most common answer is some version of "Dishonest/ Liar/ Don't trust her/ Poor character." It isn't only Republicans or conservatives who are repelled by Clinton's honesty deficit. Exit polls during this year's primaries showed that among Democrats who said that honesty was the value they prize most in a presidential candidate, Bernie Sanders racked up huge margins over Clinton. He carried 91 percent of those voters in New Hampshire, for example, and 82 percent in Wisconsin. With the release last week of a report by the State Department's inspector general on Clinton's misuse of official e-mail, the former secretary of state's reputation for mendacity only grew worse. For a year or more, Clinton has insisted that she broke no rules by maintaining her own private email server to conduct government business. She repeatedly claimed that she had nothing to hide from investigators. That she was "more than ready to talk to anybody anytime." That her reliance on a back-channel for email violated no security protocols. That it was not only "allowed by the State Department," but that the department had "confirmed" that it was allowed. That her use of a private server was "fully aboveboard." That everyone she had dealings with in the government knew about it. But the inspector general's report shreds those claims. No, Clinton never sought legal approval to use a private server for email. If she had made such request, it would have been denied. No, Clinton was not "more than ready" to cooperate with investigators: Unlike four other secretaries of state (John Kerry, Condoleezza Rice, Colin Powell, and Madeline Albright), Clinton refused to be interviewed by the inspector general. Six of her aides refused as well. No, Clinton's "homebrew" server setup was not common knowledge. Even President Obama knew nothing about it. No, Clinton's behavior wasn't "fully aboveboard." When State Department staffers voiced concerns about her insecure email channel, they were silenced by their superiors and instructed "never to speak of the secretary's personal email system again." 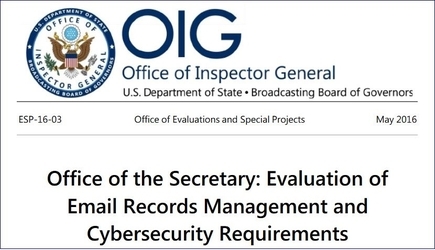 The State Department's inspector general issued a report that demolishes Hillary Clinton's claim that her use of a private computer server for government business was "fully aboveboard." A reputation for dishonesty has trailed Clinton from her earliest days in national life. The controversy over her email deceptions is only the most recent, and not necessarily the most outrageous. (More contemptible, to my mind, was publicly blaming the murder of four Americans in Benghazi on an inflammatory internet video while privately acknowledging that it was a premeditated attack by Islamist terrorists.) So far, Clinton's lack of integrity hasn't derailed her political career. Maybe it never will. Or maybe, as she competes for the White House against an opponent whose swollen ego and disregard for truth match her own, Clinton's sordid character will finally prove her undoing. "Crooked Hillary," Donald Trump has gleefully nicknamed her. The more he repeats the label, the more indelibly it will stick. Clinton's honesty gap may have seemed manageable a year ago, but that was before Trump's scorched-earth tactics changed everything. Now even the State Department all but calls its ex-boss "Crooked Hillary." How much more can her electability withstand?